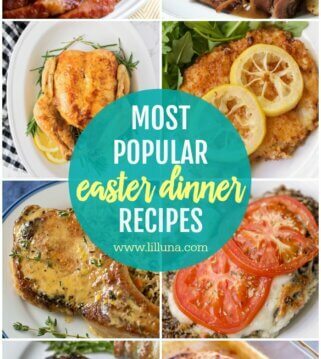 A delicious collection of the most POPULAR Easter desserts – from cakes to pies to cheesecake to cookies, these tasty treats will be an amazing addition to your Easter dinner. We love so much about Easter, but our favorite thing is being able to gather with family and have an amazing Easter dinner and think about the meaning of the day. 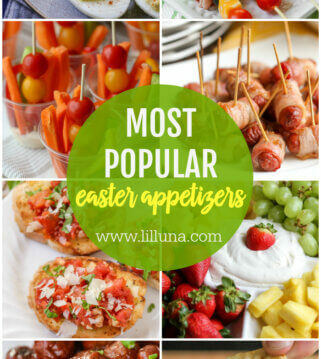 Gathering around the table with a delicious dinner is always amazing, but it’s not Easter without some delicious Easter desserts. 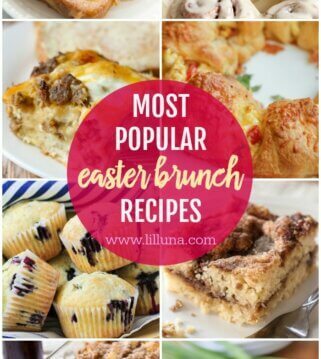 From traditional carrot cake type recipes to pies to chocolate treats, we are sharing all of our favorites with you today. We focus on creating delicious but simple recipes here on the site, so you can expect that from these desserts. And you can also expect everyone to love them, especially the kids. It may be impossible to enjoy Easter without at least one dessert including carrots. This we know, which is why we have some classic carrot cake recipes here on the site. We also have some other classic pie, fruit and chocolate recipes we know you’d love. We have a lot of FUN Easter treats here on the site. With 6 kids, we get the kids in the kitchen with us, and they help inspire some of our creations to create fun Easter desserts for kids. 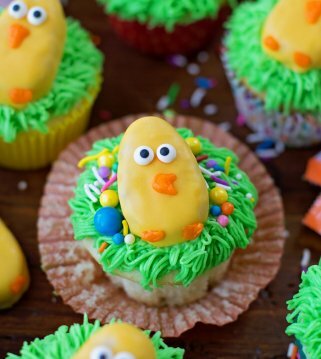 From cupcakes to cakes to cookies, here are our favorite cute Easter desserts that are not only festive, but delicious and especially popular with the kids. Although some may lean towards fruity and carrot-filled treats for Easter, we ALWAYS have to have some delicious chocolate desserts too. Because there is so much that happens around holidays and with family in town, it’s nice to have some quick and easy recipes to lean on. 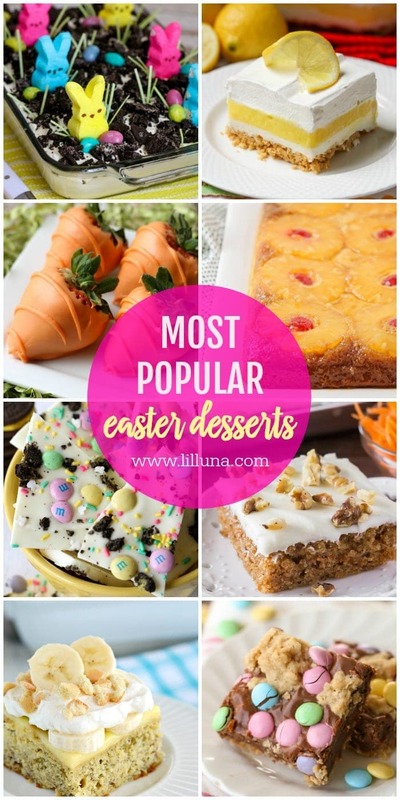 There are so many great Easter desserts to choose from this holiday season. We hope this list helps you out, and we hope you give a few a try. Please be sure to come back and let us know which ones were your favorites! Thanks so much for including our Bunny Tail Mix in this fabulous collection Kristyn! 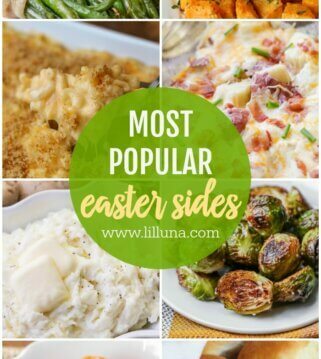 Thanks for including my Robin Egg Magic Bars!! Such a CUTE round up! What a fun round up! Thanks for including me! Thank you so much for including my Bunny Rice Krispies treats with all this fantastic desserts! I agree there are so many fantastic ones! What an awesome collection of ideas! All of them look so cute and yummy! Whoa, Kristyn…that is one amazing round-up! Thanks so much for including my Carrot Cake Sandwich Cookies and Chocolate Bird’s Nest Cookies with all of that yumminess! Thanks for featuring my Carrot Cake Cheesecake Cake. Pinning the collection! WOW, Kristyn! This collection ROCKS! Thank you so much for including my Krispy Confetti Eggs. Good thing we have a couple weeks before Easter to plan our dessert menu! Pinning! Awesome desserts!! So many choices. Thanks for the awesome round-up! Visiting your blog always makes me smile! !